The corporate media lapdogs are economic illiterates. Their continuous preaching on imaginary virtues of 'FREE TRADE', which is a non sequitur used to rationalize corporatist globalism, has destroyed America's indigenous prosperity. These fraudulent pundits or fake news presenters are presstitutes for the transnational cartels that relish the de-industrialization of domestic enterprises. Collecting a pay check does not qualify as coherent analysis, much less achieving the real world experience of actually owning and running a business. Academics who compile graphs and statistics would find making a payroll for any venture where their own money is at stake, is lacking compared to a lowly business owner who pays themselves last. The correct history of tariffs are ignored and distorted to keep people economically dumb. Lou Dobbs is consistently the voice of reason when he makes the case that Trump is the first president to fight back against unfair trade. "Just listen to all the usual swamp creatures. The business establishment, K Street and Business Roundtable, is howling and snarling about President Trump's insistence that U.S. trading partners no longer exploit our markets, but rather engage in fair, reciprocal, balanced trade." Note that all these Internationalists refuse to deal with Rational Tariffs Lower Irrational Trade Deficits. All they do is to ignore that the United States has been running a trade deficit since 1975 and never admits that our de-industrialization has been an intentional objective of the monopolists. "As historical memory diminishes and the lessons of past centuries are forgotten, the practice of systematically destroying economic independence grows. Forget about real prosperity, the concept of interdependence, coined in popular parlances by the Trilateral Commission, has made the United States economy a post industrial dependency and a bankrupt debtor. The global corporatists despise protective tariffs because these excise taxes must be paid by foreign manufacturing enterprises. Since the rush to escape American shores, the transnational ventures seek not just cheap labor, but scheme to evade any effective regulations for the paradise of third world exploitation. America’s economy was built under the shield of tariffs. The nation became the greatest industrial engine and traded profitably with the rest of the world, when reasonable excise and duties were charged on products entering this country. Just remember, the budgets of government were paid without an income tax under this system of tariffs. Who can logically argue that the deception of Free Trade benefits our population, when the current record of trade deficits continues unabated?" 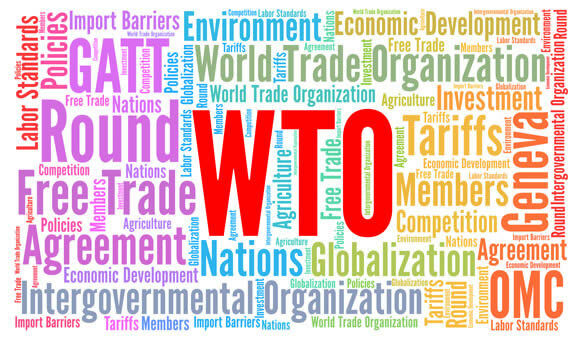 The case that Tariffs Can Restore America’s Greatness cites that the results from GATT and the WTO did not level the playing field, but allowed "so called" trading partners to dump their good into the U.S. with little push back. Also, the proper introduction of "Flexible Tariffs, when tempered with reforms in our own tax codes that require supra nationals and multinationals to enter a truly Free Enterprise environment, would greatly improve the likelihood of real competition. Consumers have been sold out with the promise of cheap foreign goods. Any short term discount has the high cost of permanent loss in American employment. When one is destitute and out of work, lower prices at Walmart won't fill the cart." This approach defines Global Fair Trade. Contrast this solution with the detrimental practice of Free Trade that our country has been under post WWII. "Free Trade policies destroy the incentive to produce in America. Living wages paid from equitable profits is sound economics. You know this to be true. So do the globalist! Their objective is to diminish the autonomy of the United States and force the merging of the remaining operations into select conglomerates, under the control of an international cabal of billionaires. Central planners will scheme to replace national sovereign and self sustaining economies, with approved suppliers operating under the Chinese paradigm of slave labor." The Chinese model of exploration is the Globalist method of stripping prosperity from our own economy. The complicity of careerist politicians in this scheme of turning the U.S. into a third world sweat shop is obvious to anyone who has the courage to stare down the sycophants of their intercontinental masters. Pat Buchanan is one such person who has lead the fight against the systematic betrayal of our nation. Mr. Buchanan has full knowledge and a command of our history that is severely lacking in the establishment political class, who are under obligation to their corporatist donors. Put yourself in the firing line and answer Why Is the GOP Terrified of Tariffs? "Does Senator Flake think Japan rose to post-war preeminence through free trade, as Tokyo kept U.S. products out, while dumping cars, radios, TVs and motorcycles here to kill the industries of the nation that was defending them. Both Nixon and Reagan had to devalue the dollar to counter the predatory trade policies of Japan. How have EU nations run up endless trade surpluses with America? By imposing a value-added tax, or VAT, on imports from the U.S., while rebating the VAT on exports to the USA. Works just like a tariff." Folks, America's trade surrender are a root cause of the demise of our domestic economy. The DC swamp, the MSM propagandists and Transnational Davos crowd all want to see President Trump fail. They especially want to prevent a resurgence of a robust and flourishing domestic work force. The very notion of revitalizing an independent and domestic produced economy threatens the tyrannical dominance of mega elites. How ludicrous the reporting on Fox Business News has become with their shift into a globalist backer. 11 nations sign Pacific trade pact as Trump plans US tariffs would have you believe that Trump is a renegade for opposing the Globalists. Well, his dumping of Gary Cohn is a good indication that America First economic policies are on the way back. The U.S., originally the biggest TPP economy, was one of the trade deal's strongest supporters before Trump took office. Trump has said he prefers country-to-country deals and is seeking to renegotiate several major trade agreements, including the North American Free Trade Agreement that includes the U.S., Mexico and Canada." Who in their right mind would believe anything that comes out of the Brookings Institute? Actually, President Trump has fulfilled his most basic promise to sink the most egregious and detrimental multilateral central planning accords. Trump's approach to use hard bargaining practices in bi-lateral trade negotiations is pure American common sense. What is so difficult about understanding this concept? If the TPP pact of countries wants access to the U.S. market, let them sell their products and services under reciprocal trading conditions. Dumping subsidized trade products by foreign regimes must cease. All the whining and yelling from the mass media and establishment economists will not balance our trade deficits. Apparently, this objective does not interest them and certainly the displacement of living wage domestic jobs has never been a concern. This reality began the groundswell that elected Donald Trump, President. Since he has made the creation of domestic jobs a center piece for his economic policies, the multinational monopolists have become unhinged. Extracting a reciprocal excise cost does not prevent trade from taking place among nations. On the contrary, it makes the long term practicality of a beneficial and mutual relationship stronger. Prosperity demands ongoing wealth creation. When the U.S. zeros out their trade deficit with foreign exploiters, the achievement of Fair Trade will be realized. Lastly, the most absurd argument used by cheerleaders for the one way voyage of container ships from China to Long Beach is that American consumers will have to pay higher costs for their purchases. No where within this lament is there a whisper that Total US household debt soars to record above $13 trillion. Just maybe sweeping a credit card or hitting the order button with your mouse for foreign produced consumption has contributed to the demise and the outflow of American cash flow to overseas conglomerates. Paying the market price for domestic goods and services will contribute more to the health of our economy than any mythical promise of transitory cheap goods sold to you by the snake oil sales reps. America needs and deserves a growing national economy that is based upon homegrown enterprises. Shortsighted "Free Traders" require a re-education to the benefits of America First.